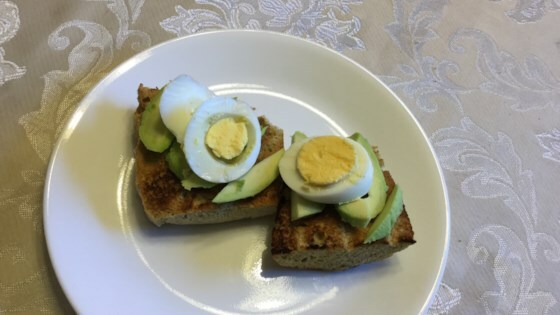 "My own twist on the traditional popular breakfast avocado toast. I make this all the time but never measure anything. For Mother's Day, my mom requested that I write this recipe down for her, so I attempted to measure as I went. And after I wrote it all down, I then decided that, since this is the third time someone's asked me for the recipe, maybe I should include it here. Feel free to play with the spices, as I normally always just add to taste. The cheese I typically use is just whatever I have on hand at the time. Sometimes pepper Jack or sharp Cheddar, but mostly the star here is the avocado spread which I've tweaked over the years. I hope you all enjoy." Heat a skillet over medium heat; fry bacon until slightly crunchy, about 5 minutes. Transfer to a cutting board; reserve grease in the pan. Cut bacon into tiny pieces. Butter both sides of the bread slices. Mix together avocado, lemon juice, minced garlic, turmeric, cumin, garlic salt, cayenne pepper, salt, and pepper in a bowl until avocado spread is creamy. Add chopped bacon and tomato; stir to combine. Heat bacon grease in the skillet over medium heat. Fry eggs over easy: break eggs into the skillet and cook until whites are firm, about 3 minutes. Slide a spatula under each egg and gently flip. Cook about 1 minute more. Season eggs with salt and pepper and move them to the side of the skillet. Reduce heat and place buttered bread in the skillet. Toast lightly, about 1 minute. Turn over and place a slice of cheese on the toasted sides. Slather a generous portion of the avocado spread on top of the cheese. Cover the skillet so cheese can melt quickly, and cook until the bottom of the toast is golden brown, about 2 minutes more. Remove toast from pan and place on plates. Place over-easy eggs on top. You can use pork bacon in place of the turkey bacon. Made this for breakfast this morning, minus the bacon. I also used Goat Cheese (dairy issues)i really liked this. Thank you for the recipe.